For some reason it’s not quite there at Amazon.com; there are some third party sellers offering the book for purchase at around double the price I’ve set. I trust the book will be live on Amazon.com in the next day or few. In a shortwhile, a pdf version of the book is available via Etsy – perfect for colorists who love to print on paper or other substrates that is suitable for their favourite medium. It contains 40 whimsical, fun, details coloring templates, where the creatures that inhabit the Doodleworlds journey through different landscapes. It is quintessentially Angela in style, quite intricate, busy, but cute and a little different to my previous books. Anyone of any age who enjoys colouring in the more detailed designs will love this. Also, the imaginative and ‘doodly’ nature of the artwork means you can let yourself go and just have fun with colour! 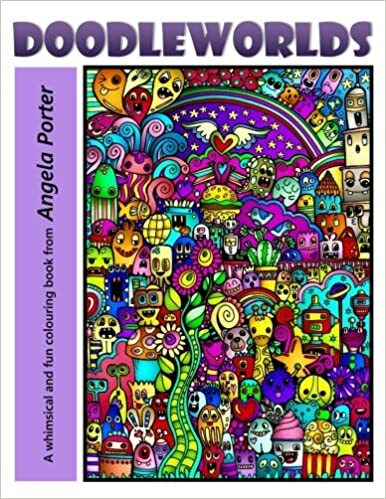 There is a facebook fan group – Angela Porter’s Coloring Book Fans – which you can join and share your coloured work with other colorists who love my work. Of course, you can also share your work directly with me via my facebook page – Angela Porter Illustrator, or on Instagram where you can tag me as AngelaPorterIllustrator. I’d love to see how you bring the denizens and realms of the Doodleworlds to life with colour.